Hopefully Spring 2.0 (AKA – warm weather) is finally here as I much prefer it to its earlier, colder version. I’m back to my daily morning walks through my neighborhood and it’s great to see all the colors bursting through the ground again. I’ve also seen several newly painted houses during my walks that have really helped to spark some creativity in me. Notice the difference the color of mortar can make in the overall look. The same can go for grout inside your house. I also wanted to include these two sets of patio furniture by Room and Board. I’ve always loved these two sets. Is it because of the style or that great splash of color? Maybe both. All of this leads me to think about summer time activities and taking the indoors out more. We’ll talk about that in the May newsletter. It was 2:00 am on my first night after moving to Moscow and jet lag had me awake at 5:00 pm Denver time. I was hungry and, luckily, my new employer had stocked my cabinets with all the American essentials they could find in Russia in 1997 – cheddar cheese, crackers, bacon, peanut butter and Chips Ahoy. At that moment, I was very thankful for a common cultural palette. I’ll never forget as I sat in my new kitchen, listening to all the strange sounds in my new city, I started to study the small room. It had the tiniest non-dorm room refrigerator I’d ever seen, wallpaper from the 1950’s and a pocket door. 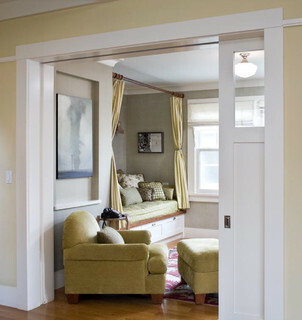 Traditional Living Room by Menlo Park Architects & Building Designers Ana Williamson Architect A pocket door! I was in love with this place all because of a pocket door. Never mind the twelve foot high ceilings, the corner balcony, the eight foot tall casement windows, or the stuffed pheasant above the front door – I loved this apartment because of the pocket door. Every contractor I know despises pocket doors. One I work with even refuses to install them because they so easily come off the track and the only way to fix them is to tear down the wall. Waaay too much work. One day, when I tried to convince said contractor to install a pocket door in a tight space, he jokingly suggested I use a sliding barn door instead. Having grown up on a farm, I knew exactly what he meant. (Why hadn’t I thought of it?) Unfortunately, the hardware wasn’t easy to find at that time. Flash forward four years and sliding barn doors are everywhere. Thank you Pinterest and the rise of the industrial look. Light, Oh how I’ve missed you this winter. I realize that living in Colorado I get plenty of light during the day but the days are shorter this time of year. I’m so happy that it’s staying lighter longer into the evening as well as coming up earlier in the morning. Sadly, it still isn’t enough as my doctor advised me to up my dosage of vitamin D.
Let’s talk about a different kind of light though. Actually, let’s LOOK at a different kind of light. These are a few of the lights I’ve come across recently and I found them interesting enough to take a picture. These chandeliers are hanging in the staircase at the Restoration Hardware flagship store in Denver. Beautiful lighting at Union Station. Don’t forget to look up. Check out these industrial fixtures at Aviano coffee. Just some pipe, wires and a little ingenuity and you could maybe make these for yourself. I saw this at Le Boutique des Boudreaux in Morrison. It’s a birdcage over a chandelier which gives it a bit of whimsy. Potentially an easy weekend project if you want to try it yourself. Ok, this isn’t a light fixture for your house as much as it is a beautiful sunset. I mean, we’re talking about light after all. Have you seen a fantastic fixture recently? Maybe it was a “typical” fixture used in an unusual way or in a unique finish. Tell me about it, I’d love to see pictures. Is the thought of painting too stressful for you? Do you consider yourself an early adopter of technology? Do you get excited about the launch of a new product from Apple or Microsoft or Samsung? Do you even stand in line to be one of the first to purchase the latest and greatest launch? Conversely, do you find that the colors in your home are the same as they were 10, 15 or 20 years ago? Or, when you finally decide to make a color change do you ruminate about it for weeks or months? I’d say if the second scenario sounds like you, you’re not alone. Many of my clients are right there with you. 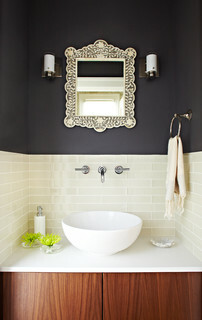 They know they need a change but the thought of changing paint colors is daunting. Why? Well, let me list some of the reasons I’ve heard from clients who are stuck. Painting is a lot of work. Even if I hire it out I still have to move everything into the center of the room and that China cabinet from my grandmother is heavy. Not to mention I have to take down all my art. What if I don’t like the color once it’s on the wall? The last time I painted I made 4 trips to the paint store and I still don’t really like the color. I’m not going through that again. I have vaulted ceilings and all the rooms flow into each other. There’s no real place to change the color. That scares me if I make a mistake. It turns out that all of them are fears. Fear of doing manual labor (that might result in a unsatisfying result) and fear of wasted efforts with again, unsatisfied results. Let’s look at this in relation to your technology purchases. You don’t think twice about standing in line to get your new laptop, iWhatever or phone. It’s exciting but it still takes your time. You don’t worry about not liking your purchase because that brand always puts out products you love. New technology takes some getting used to but that’s part of the fun. You can even pick up a book about your new phone at the store. There are experts to help. Wait, experts to help? What if you applied that to picking paint colors? Imagine how much less stressful it would be if you had an expert to help you navigate the color wheel. Ahhh. While I don’t know a single designer who will help you move your furniture, unless you are a blood relative or have something you can use to blackmail them, you can hire one to help with the color selection. Think of all the stress and worry that would be alleviated by hiring help. 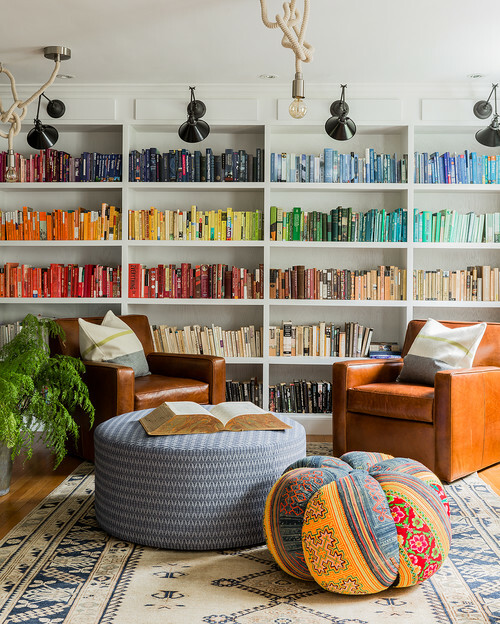 Designers have had special training on color theory which gives them a full understanding of how colors work together in your home, how lighting interacts with the colors and how the color will appear in large scale. Additionally, they’ve worked with many many colors and know what works with what type of room and furniture. They know which colors cast a warm feeling or a crisp undertone, how colors should flow from one room to the next. That alone should lower your anxiety about painting. So now, thinking about painting should be less daunting than thinking about standing in line for the next gadget. Don’t you think? Every few years I do a “reset” on my house and get into a major purging mindset. I typically know it is time to do this when my kitchen table hasn’t been seen in about a month or my extra bedroom is filled to the brim or my closets are full. So, time to purge. Purging at the end of the year feels more overwhelming–like a whole life endeavor. But at the beginning of the year, purging is a little more cathartic to have extra space in my house and my head. My word for 2016 is Balance and in that mode, I’ve decided to refocus the function of my extra room into that of a craft room to restore creativity I give out on a daily basis. I need to have a space where I’m able to be creative for me and only me; a place to refill my cup so I have more to give to others. Fortunately, I don’t need a home office since I have an off-site office where I can work for my clients. This craft room will be a space where I can design bouquets, make cards or jewelry, draw or do whatever inspires me at the time. This room has excellent natural light. The ideas are brewing, I can feel it. I’d love to show you before and after photos but not yet. It is only the 6th of January after all. If it was that easy to get done, I would have done it long ago–right? So, I only have a before picture. You get glimpses but you can see it entirely in the newsletter coming out next Wednesday. Here’s what you will see: boxes on the floor, chairs and tables. This is good. There may be a lot of boxes but they are organized by categories and not just randomly thrown together. 1. I created 6 empty boxes – Throw Away, Recycle, Arts & Crafts, Home Filing, RCD Filing, ? & Give Away. 2. I placed those above mentioned boxes in a row in another room and then I started at the door; working my way around the room clearing the floor first. I didn’t think too hard about what I had in my hands. My initial thought was, “Which box does this go in?” That was it. I’d already created my categories so I didn’t need to think anymore. I know myself well. Crucial to making this work is that I couldn’t stop to think what I would do with each item or where it came from. That end result would hang me up and I’d become paralyzed. Instead, “Which box does this go in?” was the only question I could ask. There will be time for more questions later. 3. Once I found the floor I moved to the shelves closest to the door, then the desk and then the shelves farthest from the door. Still in the same direction as I started on the floor but moving up in the room. That’s as far as I’ve gotten for right now. Remembering that BALANCE is my word for this year I mixed in time with friends and family last week rather than being trapped in my house because of the room. I still have one more bookcase to purge before I start to put it all back but I did actually use the room on Sunday. I had my goddaughter over to make jewelry and we sat in there. It has the best afternoon sunlight and I can hardly wait to get everything put away so I can start using it on a regular basis. Apparently I like the idea of containing my life but haven’t figured out exactly how to do it. Do you have a room where things go to die? Are your closets bursting at the seams? If so, I hope you’ll be inspired to take action. I’d love to hear about your dreaded space and how you’ve tackled it. I view a large portion of my job as an interior designer to be that of educator. I’ve never been one to tell people what to do without explaining why they’re doing it. It probably stems from my own need to understand why I am supposed to do something rather than just doing it because I was told to. I’m sure I drove my parents crazy through the years. I often remember my mother telling me I wore her out with all of my questions. I don’t typically think about the sharing of this information until I have a client that I’ve been working with for a while repeat it back to me. They always point out that they learned it from me. “See, I was listening to you!” It secretly fills my heart with joy because I realize that I am impacting people in a long term, non-superficial way. I was thinking about some of the other tips I pass along randomly throughout my days and decided to share a few more with you here. If there is one question that I get the most, it will would be how to organize bookshelves. For some, bookshelves take up a lot of real estate in a living room and getting it to feel “right” doesn’t come intuitively. Height of books – While this one seems pretty obvious there is something in us, most likely memories of our elementary school librarian teaching us about the Dewey Decimal System, that overlooks it. Look at your bookshelves and you’ll most likely notice slight visual disarray. (You could also blame your children or spouse for this. I won’t call you out.) By arranging from tallest to shortest it creates a consistent line and is visually more calming. Line up the spines – This goes along with organizing by height. Pull all of your book spines to the same place on the bookshelf as the deepest book. This will create a clean line along the front edge of the bookcase. Another calming affect – and who couldn’t use more calm in their life? By Color – This one is a little out there for most people. Visually it is exciting, however, people worry they can’t find the book they are looking for which tends to keep them from considering this option. All of the people I know who do this are very visual people and tend to remember the way a book looks more than the title. If this applies to you, try it. You spend a lot of time here, even if you don’t cook a lot. There are basic functionality reasons why certain things work better than others, and in the kitchen, efficiency is top priority. Kitchen Triangle – We’re talking about your major appliances here. Sink, refrigerator and range/oven/stove. Appliances like your microwave or coffee maker don’t fall into this category. If you hate your kitchen as it is right now this could be the reason it doesn’t work. Are the appliances too close so there isn’t ease of movement between them? Are they too far apart so you find that you’re carrying pots a long way from the sink to the stovetop? Think about the “triangle” in your kitchen. It’s most likely the place to start thinking about a redo. Landing Spaces – This goes along with the triangle. Think about how you use you’re kitchen. Is there counter space close to the refrigerator to set food on as you load or unload for cooking? Where do you rest hot dishes that come from the oven? 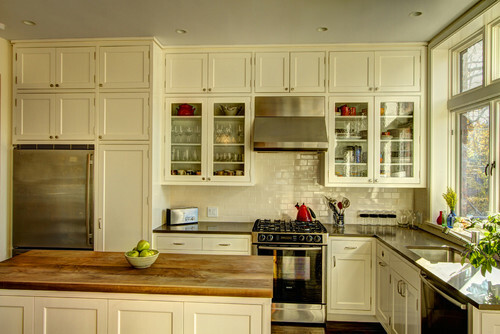 Microwave Placement – Microwaves don’t always need to sit on the counter or hang on the wall above the stove. What?! Yeah, they can become part of a bank of ovens. You could get a convection/microwave combo. Or, you can place the microwave under the counter in a cabinet. They even have microwave drawers. Think outside the box on these. Dishwasher Placement – Typically dishwashers are placed on the left side of the sink for right handed homeowners and on the right side for left handed homeowners. Think about it – you hold the dish in your non-dominate hand to scrape it into the sink and then you turn your body to that same side in order to place it in the dishwasher. Go ahead. Try it now. I’ll wait. See how much easier and more natural that is? Finish Color – Make sure when looking at a color, no matter what finish (paint, fabric, wood, tile, etc.) you view it on the plain in which it will live. If it is on the wall hold it vertically, the floor – horizontally facing up, or the ceiling – horizontally facing down. Think back to the comment about how light affects color and this will make sense to you. Wall Color – Leave paint samples out as the lighting changes throughout the day. The light changes throughout the day and into the evening so your walls will look different. Make sure that you like the color in all of its states. Wish I had covered other categories or these in further detail? Comment or Email me and I’ll try to help. That’s exactly what my friend Alissa Silkwood asked me to help her do. She’s a landscape designer who is fearless with color in her home and in her fashion, so she is drawn to this holiday for visual reasons. 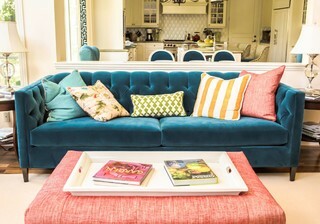 Currently, her living room ceiling is a dark brown and her walls are a light emerald green with pops of coral, pink, and peacock in her accessories. I told you she was FEARLESS. It’s beautiful, and she has done a wonderful job of pulling it all together, but she is ready for something new. I don’t know what I love more about my job, the beautiful spaces I help my clients create or the self-discovery I get to watch as they take the time to think about why they are drawn to specific colors, shapes, textures…beauty. So, now we’re discovering what sophisticated Day of the Dead will look like in a home. Have you ever considered using a particular holiday to design a room around? Maybe it was a piece of art, a vacation or a movie? Please share because I’d love to hear about it and you might just inspire someone else. I’ll keep you posted on what “Sophisticated Day of the Dead” looks like in a home so check back.